I'm sure that many of you reading this don't think of camping in New York state as dreamy, but damn was this a nearly perfect vacation. We floated under waterfalls and swam in swimming holes, ate ice cream and had lunch lakeside, we hiked and made s'mores and spent a ton of time chatting and planning new adventures during long car rides. A bunch of tiny things that created one of the best vacations I've had in a long time. This trip served double duty for us. We wanted to plan a camping trip where we could get out of the city for a little while but we also wanted to check in with a bunch of G's family and friends. So we planned a camping trip to several New York state parks with a final stop in Buffalo, NY. I wanted to share some of the places we went, things we did, and place we ate. As someone who likes to do a lot of research and check out photos of the places she goes, trying to figure out where to go was a little difficult. So I thought I would put together a little round up for anyone interested in checking out the area. I should start by saying that I'm using the term "hiking" very loosely below. I'm not someone who hikes often (or ever) and this was maybe the first vacation I've been on since childhood that I even brought sneakers. Everything we did was very easy and didn't take more than an hour or so. We went to Robert H. Treman State Park, Taughhannock Falls State Park, (both near Ithaca, NY), as well as Stony Brook State Park (further West). RHT Park has a great swimming hole/waterfall area with a diving board and lifeguards, along with hiking trails through the center of the park. I imagine there's usually a lot more water flowing along this trail, but NY was having a bit of a drought when we were there, but still beautiful nonetheless. Our first stop once we got to Taughhannock Park was the waterfall lookout, where you can look down on this massive waterfall and hiking trail. It also has a lake area where we picnicked and watched kids swimming in the water. We hiked along the main trail to the foot of the waterfall, which didn't have a lot of water but was still impressive and worth the easy hike. Stony Brook Park was definitely my favorite. Larger than the other two, we spent the whole day there swimming, hiking, and floating under the waterfall. Like RHT, this park also has a swimming hole area with lifeguards and different sectioned off depths. We ate lunch in the shaded picnic area under the trees and then took the main trail through the park. There's 2-3 waterfall areas along the trail and we stopped and hung out to swim under one of them. 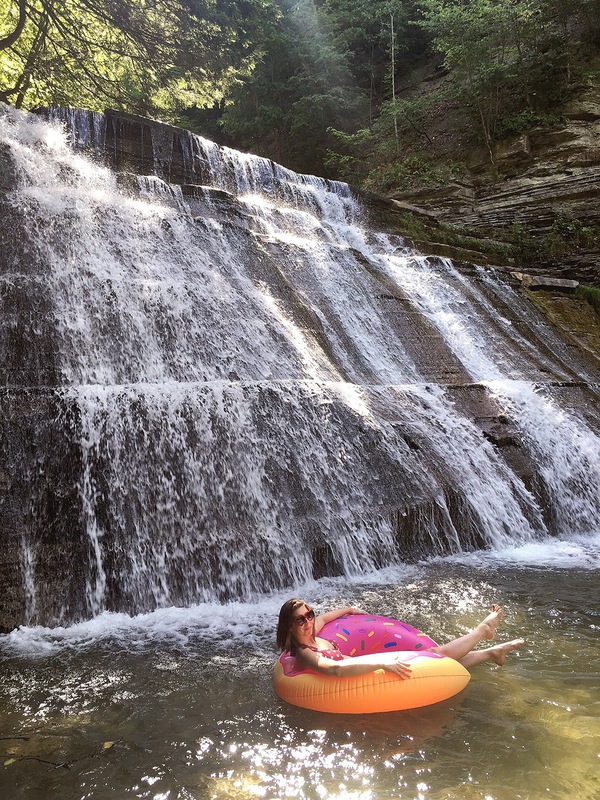 It was exactly what I wanted to do: float in my inflatable donut tube under a waterfall. We camped in Buttermilk Falls State Park and Sugar Creek Glen Campground (because Stony Brook was booked up). We only stayed one night at each but both were fine. Buttermilk has it's own swimming hole/waterfall (which was pretty dried up when we were there) and hiking trails that we didn't explore because we were just exhausted. Sugar Creek has a stream and (apparently, we didn't see it) a waterfall area as well. Because it's a camping ground and not just a park, it did have a good amount of kids and large groups. But I'm sure it's different depending when you go. Both had decent bathrooms and we had no problems at either. One of the best things about this vacation was how affordable everything was. It costed us $7 to enter the first state park, but that gets you into any state park that day. So day 1 we paid $7 to get into RHT, then got into Taughannock for free, and that same receipt got us $7 off our $20 camping site in Buttermilk. Then, our receipt from camping got us in any state park for free the next day, so we entered Stony Brook free. Sugar Creek was the most expensive part; camping there was about $30. Part of the reason I love vacations is eating at new places, splurging on food and drinks, and really going all out. From the car snacks to fancy dinners, I'm all in every time. Give me all of it. Dinosaur BBQ (Rochester, NY): Definitely a fun place with all the BBQ standards. G and I both got combos that came with two different kinds of BBQed meat, two sides, and cornbread. Everything I wanted in a BBQ meal. Purity Ice Cream (Ithaca, NY): This place was great. It's huge for an ice cream shop with seats both inside and outside. Tons and tons of flavors, cone options, sundaes, and milkshakes to choose from. Serving sizes were also huge. Cuba Cheese Shoppe (Cuba, NY): I think the most expensive part of the trip was deciding to pull off the highway and wander around this cheese shop. Not because things are expensive but because we bought maybe 6 different cheeses and some salami. ANYWAY. A great little shop with so many cheeses to choose from. They had everything I was hoping to get, along with cured meats, cheese curds that they make in-house, and tons of other spreads, crackers, etc. I haven't opened my stash yet, but definitely stoked to have a cheese plate night soon. Buffalo Proper (Buffalo, NY): This was one of the best meals I've had in a long time. We ordered a handful of small plates and two entrees to share amongst us (there was 4 of us) and everything that came out was better than the next. My two different cocktails were also delicious and gorgeous. I'm a sucker for a pretty drink. Breadhive (Buffalo, NY): I've become addicted to breakfast sandwiches. And the breakfast sandwich I ate at Breadhive was aces. Maybe one of the best breakfast sandwiches I've ever had. If not the best, than definitely a close second. It's super cute inside (they have a bagel wall!) and just so full of charm and personality. Good coffee, good quality baked goods, and great breakfast sandwiches. I'm sold. As you read this, we are driving to New York state for a long weekend of camping and seeing family and friends! Even though New York is close to Philadelphia, I've never spent too much time in the state and I'm excited to explore what it has to offer. We're camping and visiting several state parks, hoping to swim in waterfalls and swimming holes, have some dinner plans, and just happy to be getting out of the city for a little while. Follow me over on Instagram for some updates!